In 1866, the Great Fire of London is said to have consumed 70,000 homes! 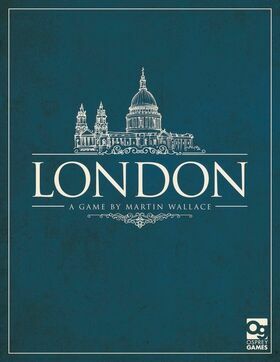 In Martin Wallace’s second edition of London by Osprey Games, players take part in the grand effort to rebuild that city. Those who do the best job will have generated the most prestige and successfully managed to control a constant influx of poverty. It sounds simple enough, but there are a lot of moving parts that come together in a game that is destined to become a classic. 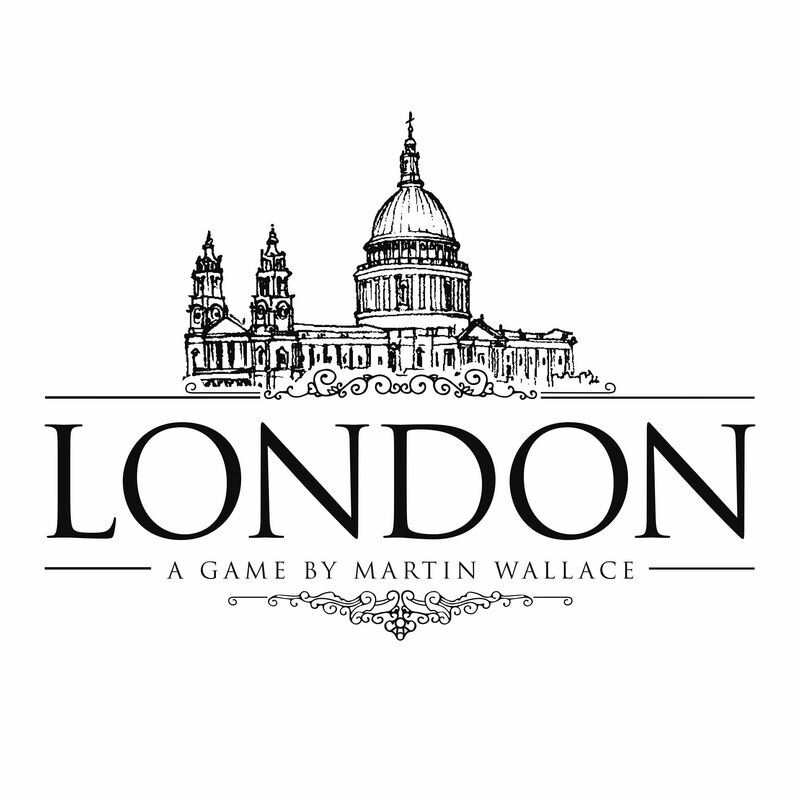 In London, you play cards face-up into your city. When you have enough face-up cards to satisfy your current strategy and/or the ability to afford it, you “run” your city. That means, one by one, each card you’ve played in front you is activated for its benefits. These benefits usually include giving you prestige (which you need to win), gaining money and alleviating poverty. Then, in an interesting mechanic, each card you’ve activated will flip over, never to be “run” again in a future turn. You begin this process over and over again, continually collecting and spending money, gaining and alleviating poverty, and hopefully, gaining lots of prestige along the way! What’s all this talk about collecting poverty? You’ll find it flowing toward your side of the table on a regular basis every time you run your city. Running your city over and over again means you have piles of cards in front of you. Just how many you have is up to you, but for each pile, you will collect one poverty token when you run your city. In other words, if you want all the benefits that eight face-up cards will give you, that’s great, but you’ll also collect eight poverty when you run it! 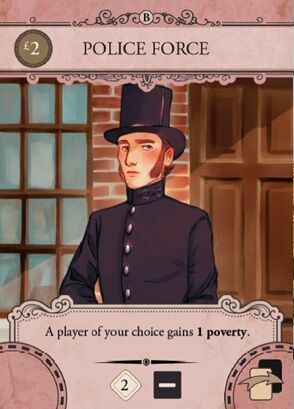 Players also collect poverty for the number of cards remaining in their hand after running a city (max hand size is nine), as well as for every $10 loan that has yet to be paid. Yes, money isn’t an issue in this game, because the friendly neighborhood bank has no problem giving you money anytime you need it, and as much as you want! (Sub-prime mortgages anyone?) The upshot is you’ll have to repay each $10 loan with $15, and if you don’t, each loan will not just give you an extra poverty when you run your city, it will deduct seven prestige from your final score at game’s end. All this poverty has a large impact at the end of the game. The player with the least poverty may discard all of it. Then, other players discard a number of poverty equal to that player, and whatever remains will result in a loss of prestige as indicated on a poverty table. For instance, four poverty at the end of the game will result in a loss of three prestige, which is not too bad. Ten poverty at the end will be a loss of 15 prestige! Believe me when I say, it can get even worse. Everyone wants to buy a borough in London. Thematically, they represent the best buildings and locales. 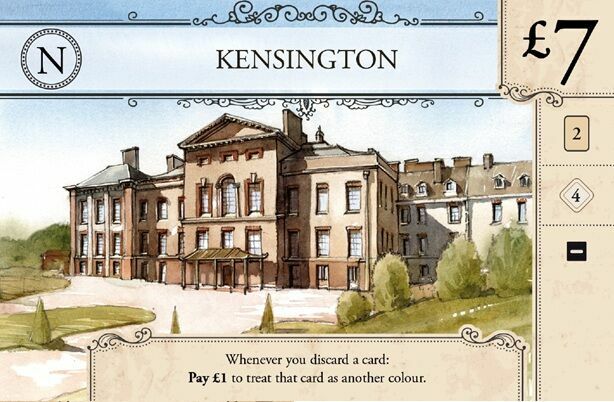 In game terms, they’re super-sized cards with better-than-average benefits, many of them ongoing. Burroughs are often a good way to collect some quick prestige, draw cards and alleviate poverty. There are some negatives from time to time, such as effects that trigger when you run your city, resulting in extra poverty or an actual cost, but overall they are nearly always a good buy. Each burrough you acquire goes on top of any others you’ve purchased, and therefore only one of your burroughs is active at any given time. 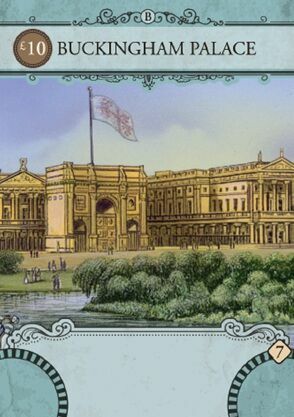 The main deck of cards in the game (City Cards) are layered to get more interesting, powerful and expensive as the game goes on. As explained earlier, playing them into your city and eventually running them forms the heart of the game. Another important benefit of some city cards is the prestige they give a player at the end of the game, so benefits can extend after a card has flipped over. In fact, some more expensive cards, such as various monuments, only have an end-game prestige benefit. I found the way in which you obtain and discard cards (a requirement for running cards in your city) another fun aspect of the game. The game board is designed to hold up to ten face-up discards (most cards are played into a city by discarding another card of the same color), with the bottom row dropping off permanently when full. When players draw cards, they can draw from the board or from the face-down deck. In this way, even the simple act of discarding cards can become a strategy element, as you know that another player will have the ability to pick it up! Wallace seems to have this magical way of balancing a ton of competing elements in a surprising way. I use the word surprising because there seems to be many ways in which so many disparate elements and moving parts could go awry, but they don’t, and in fact they actually play off one another beautifully. When poverty gets to be too much, most players can find a way to reduce it, but at the expense of doing other things. When money is short, you can get the money you need for your projects, but will you make your money back? There are ways to do it, but are you better served pursuing other strategies? 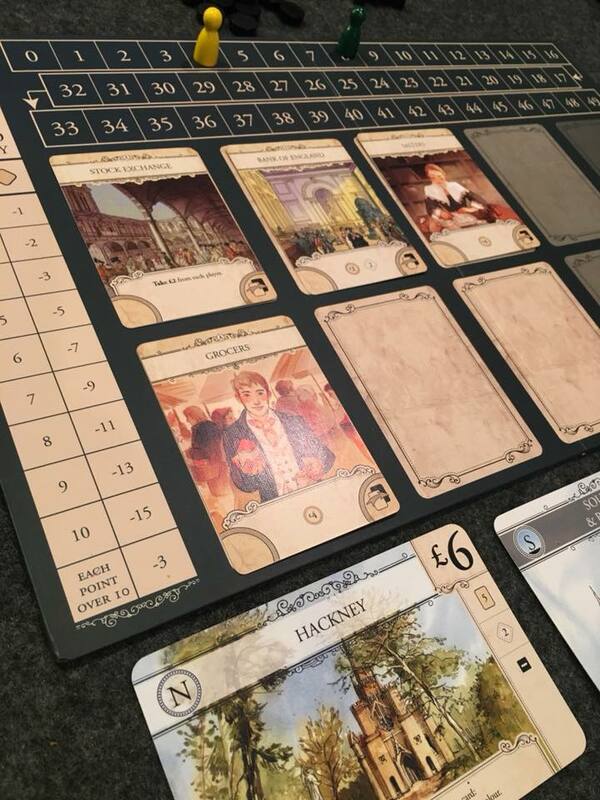 Burroughs are a quick way to get prestige, but maybe you want to sneak your prestige in at the end through the lower-valued prestige values of the City cards you’ve been running (everyone will count these up at the end, even the face-down cards in your piles). Every game of London will feel different, and with a four players (the sweet spot in my opinion), a typical game will last a few hours. Games with fewer players, and especially two players, may take longer because the deck of cards remains the same size, though you will inevitable get to take more turns. 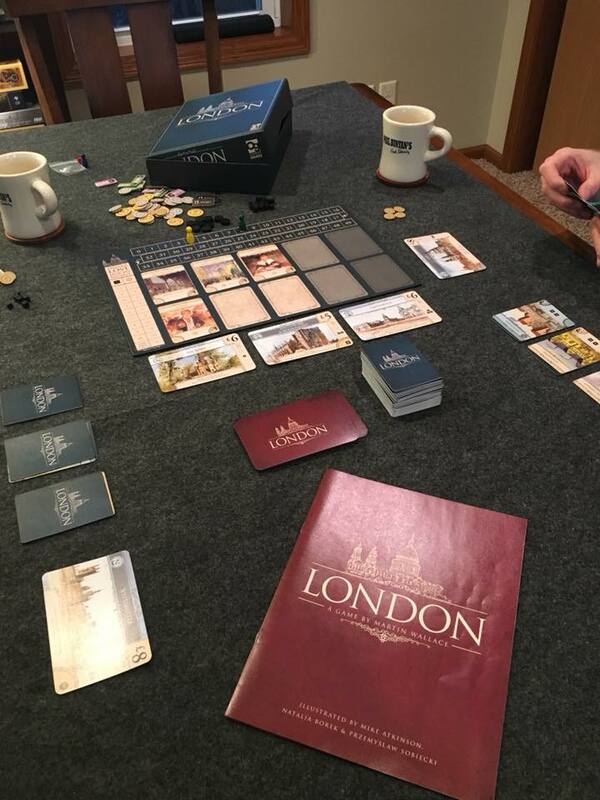 In either case, London, while geared toward more seasoned board gamers, is easy enough to teach to most players (my 12-year-old and wife picked it up quite well) and gameplay becomes intuitive after a few rounds. I’ll be keeping this one and playing it often. Cheerio! Spot on! Jolly good! 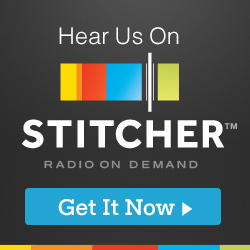 London is also discussed on our podcast episode, Pooping Out Cubes. Ace review. It looks like a really interesting game. I hadn’t heard of it before, but now I will keep an eye out. Thanks, Luke! I was pleasantly surprised at how great this game plays. Take care and game on.